The Global Small Business Blog: How to Improve Customer Service the World Over? Photo courtesy: ©Laurel Delaney 2012, "Whole Foods Customer Suggestions"
Improving customer service can be as simple as tacking up a bulletin board (as shown above at a Whole Foods Market in Chicago) and letting customers say what they want to say. Who knows, you might end up with improvements on the way you do things and some great ideas! The goal is to bring out the best from your global customers and stakeholders by giving them an area to share and discuss feedback. What have you done lately to improve customer service? Let us know -- especially any online platforms you've developed -- and we'll post your ideas here. Thanks, Happy December 1st and have a great weekend! 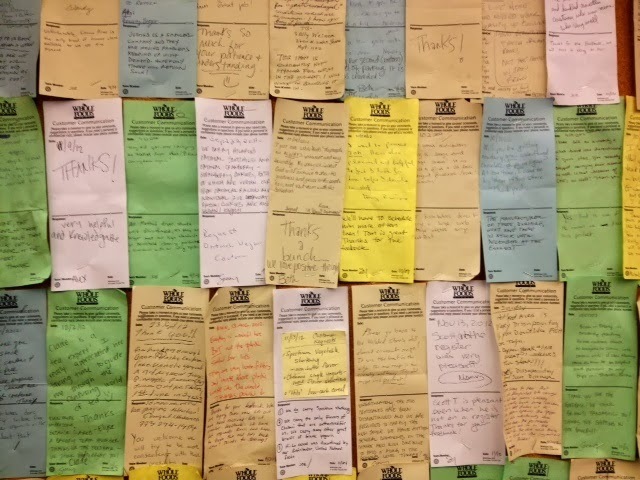 Love the public nature of feedback in that Whole Foods photo!